Is Management Really to Blame for Hecla Mining's Woes? The Lucky Friday mine strike has significantly impacted operations this year. Is management's handling of the issue to blame? 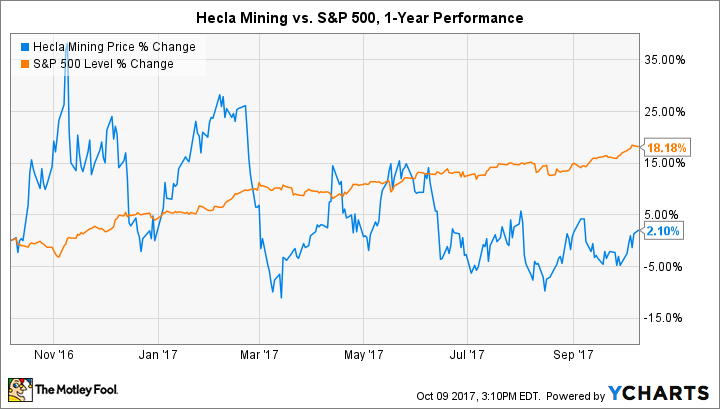 Investors have been remarkably patient with Hecla Mining (NYSE:HL) despite a difficult 2017 thus far. Production volumes fell substantially through the first half of 2017 compared to the year-ago period for all four of the primary metals mined by the company, including silver, gold, lead, and zinc. Then again, 2016 was a record year. But does it still make sense for the stock to be coasting on last year's performance? After all, it's October now. The ongoing strike at the Lucky Friday mine has significantly impacted operations. It's been offline for two full quarters now, which has cost shareholders tens of millions of dollars in revenue and earnings. The stock has moved sideways in the last year throughout it all, better than many competitors can claim, but that's nothing to brag about given the S&P 500's 18% rise in the same period. As the losses pile up from the Lucky Friday strike, it may be time to start asking whether management's handling of the issue is to blame for the stock's performance. Is management just being stubborn? The last agreement with the roughly 250 unionized workers at Lucky Friday (not all employees at the mine are represented by a union) expired on April 30, 2016. On Feb. 19 of this year, the unionized workers voted against the company's contract offer. On March 13, these workers went on strike to protest unfair labor practices, which made it impossible to operate the mine. It has been offline ever since. On June 19, the National Labor Relations Board issued a complaint against Hecla Mining management for how it behaved leading up to the last contract offered to the unionized workers at Lucky Friday. The strike has had a substantial financial impact on Hecla. Silver production in the first half of 2017 fell by 858,000 ounces compared to the year-ago period. That was worth about $23 million at 2016 prices. Hecla Mining also incurred suspension-related costs of $8 million. All told, Lucky Friday's operating income swung $12.2 million in the first six months of this year compared to the same period in 2016, to an operating loss of $8.2 million. Most of the first-half 2017 drop-off occurred in the second quarter of the year. Therefore, considering that the mine was offline for the entire third quarter as well, investors should expect a similar decline in year-over-year operations in its third-quarter earnings that it saw in the second quarter. That would amount to roughly $15 million in Lucky Friday operating losses through the first nine months of 2017 and a swing of at least $20 million in operating income from the year-ago period -- and that's before mentioning that the company's other two mines have also dropped off a bit this year. So, is management to blame for Hecla Mining's woes? Put another way: Would finding a compromise with unionized employees back in March, even though it would have slightly increased operating costs, have been more shareholder friendly than eating a $20 million (and counting) swing in operating income? Looking back, I don't see any good reason for management's decision. Its other two mines -- Greens Creek and San Sebastian -- don't have a single unionized employee. So agreeing to union demands at Lucky Friday wouldn't have risked setting off a domino effect across its operations. What it looks like to me is simple stubbornness -- or clinging too closely to projected operating cost numbers on a spreadsheet. Again, I could be wrong, and we don't know all of the details. Management has given its own view of the events leading up to and during the strike, and it may prove correct in the end for holding its ground. But that doesn't really matter today, almost seven months later. What matters is that Hecla Mining very likely would have been better off financially if it had come to a favorable deal with the unionized workers at Lucky Friday. Now it's dealing with the consequences -- and shareholders are suffering as a result.